Poisoning - Was It Really An Accomplished Fact? KIEV, Ukraine -- The Office of Ukraine’s Prosecutor-General plans to close the chapter on the famous case of the presumably intentional poisoning of the former Ukrainian president Viktor Yushchenko, Ukraine’s new Prosecutor-General Viktor Pshenko said. Viktor Yushenko before and after alleged poisoning. The Ukrainian prosecutors have been unsuccessfully investigating the case of the alleged poisoning, which took place in September of 2004, for 5 years now. Two special investigatory commissions of the Verkhovnaya Rada (Parliament) found no signs showing that what happened was intentional poisoning. 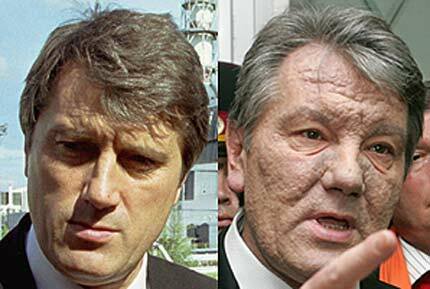 Six years ago the disfigured face of Viktor Yushchenko and a story that he was allegedly poisoned by the enemies of democracy, as analysts say, became the decisive factor for the victory of Viktor Yushchenko at the presidential elections of 2004. Because this added him from 10 to 15 per cent of the vote. At the very beginning, the story with his poisoning triggered doubts among many influential experts. However, the then “Orange” vice-speaker Alexander Zinchenko claimed that a biological weapon was used for this purpose. The version to the effect that he was poisoned by dioxin (a harmful chemical substance, poisoning the environment) emerged much later. But neither the Ukrainian specialists nor their colleagues from the Rudolfinerhaus Clinic in Austria, where Yushchenko underwent medical treatment, found any signs of intentional poisoning. He was diagnosed with pancreatitis by the Austrian doctors, which often is the result of the excessive consumption of fat food and alcohol. Moreover, a scandal emerged at that time because the Austrians said that some of Yushchenko’s closest supporters made an attempt to put pressure on them so that they would confirm the fact of poisoning. After the “Orange Revolution” victory Ukraine’s Prosecutor-General resumed his investigation. However, Yushchenko who was the President of Ukraine at that time, was not in a hurry to undergo medical tests, which was strange enough, as politologist Sergei Markov said in an interview with the Voice of Russia. He didn’t undergo the blood test for nearly one year, which would have made possible an analysis of all these things possible. And he has never undergone the blood test in Ukraine. Viktor Yushchenko handed over the materials for conducting a judicial examination only in the autumn of 2005. According to the prosecutors, the examination confirmed the fact of poisoning. But the 5 years the investigation was underway produced no results at all. Moreover, after the quarrel, which occurred among the “Orange Revolution” supporters, some of Yushchenko’s closest companions-in-arms, including the Verkhovnaya Rada Deputy David Zhvaniya hinted that the whole story about Yushchenko’s poisoning was simply an invention. And now the Prosecutor-General is trying to find out whether Yushchenko was really poisoned or whether this was not true. According to Ukraine’s Prosecutor-General, today Yushchenko is doing his utmost to avoid a new examination.